Those of you in your last year of school or finishing up your A-Levels will soon find yourself master of your own destiny for the first time. What career path will you choose and how do you pursue it? You’ll be looking for a future-proof career with lots of opportunity for personal and professional growth. If you are a practical person with good problem-solving skills and a keen eye for detail, a career in the electrical industry could be for you! What opportunities are on offer? High demand – Countless pieces of research have found that we are lacking in skilled workers in the UK. In short, we need more electricians and many employers will be seeking out young, fresh talent to boost their businesses. Sector specific schemes – A new electrotechnical apprenticeship scheme is being introduced for the start of 2017/2018 academic year. New ‘Trailblazer’ apprenticeships are giving more focused training which is more valuable to both employers and apprentices. Incentivised training – A new funding model means that the government fully fund apprenticeships for 16 – 18 year olds, with some funding also available for older applicants. Deciding how to spend your time after you finish compulsory education is a huge deal, but it can be as daunting as it is exciting. To help you out, we’ve written ‘The Ultimate Guide to Electrician Careers’ which contains lots of links to resources and information that will help you along the way. For students entering the electrical sector, the best qualification route is an apprenticeship, where you’ll be taken on by a company and learn on the job. You’ll complete an advanced apprenticeship, which takes 2 – 4 years to complete, but your commitment will pay off once you are qualified. Your tutor or careers advisor will be able to help you to research and find a position. Local electrical companies are a good place to start, but large national companies, such as SSE, also advertise apprenticeship positions on their websites – there’s a link to this in our free guide. It’s a diverse career, with plenty of options for taking different directions as you gain experience. As well as domestic installations, you could also train for the commercial market, carrying out large-scale installations and working on civil engineering projects, or tap into a niche market with specialist training. You can earn as you learn as many of the training routes are ‘on-the-job’. Plus, the wages are not to be sniffed at – as a fully qualified electrician you could be earning anything from £25,000 – £40,000. If you start your own electrical company in the future, this could increase even further. 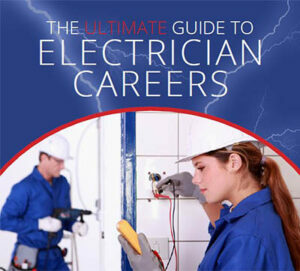 Our ‘Ultimate Guide to Electrician Careers’ is a practical and clear guide to kick starting and developing a career as an electrician. It provides comprehensive information about the skill sets required, qualifications, electrician apprenticeship and training routes available.